When you’ve got enough money to build a moon-sized, planet-destroying space station, you can clone an army of millions of soldiers using the loose change you find in a sofa. For those of us who aren’t quite as well funded, UBTECH Robotics has thrown some Stormtrooper armor on one of its 16-inch tall humanoid robots so you can build a slightly more affordable army. Will you be able to take over the galaxy using UBTECH’s Star Wars First Order Stormtrooper robot? We wouldn’t recommend placing an order for hundreds of AT-ATs and Star Destroyers just yet, but the tiny self-balancing bot does include a sentry mode so you can use a free accompanying app on a mobile device to set up a designated area for your trooper to patrol and monitor for invaders. And because augmented reality is the buzzword of the day, the free app can also be used with a smartphone or tablet to place the robot into interactive experiences. The robotic Stormtrooper even responds to basic voice commands, and can remember and react differently to up to three different faces using biometric identification. But to ensure interactions and IDs don’t fall into the hands of the Rebels, UBTECH keeps this robot offline and doesn’t share anything to the cloud. Like with Sphero’s interactive Spider-Man toy, UBTECH is going out of its way to avoid a seemingly inevitable hack. 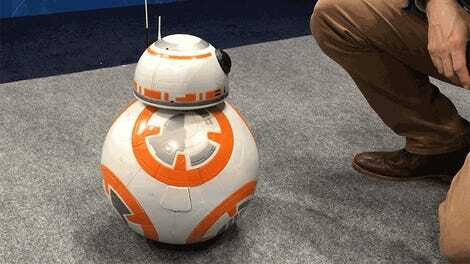 A few months ago Sphero had me especially excited about the future of robotic toys with its Ultimate Lightning McQueen, and with this robot Stormtrooper that walks around like a human, UBTECH has shown that kid-friendly robotics don’t have to only roll around. It won’t be a cheap future, however. Like Sphero’s Lightning, UBTECH’s Star Wars First Order Stormtrooper robot includes a $300 price tag. 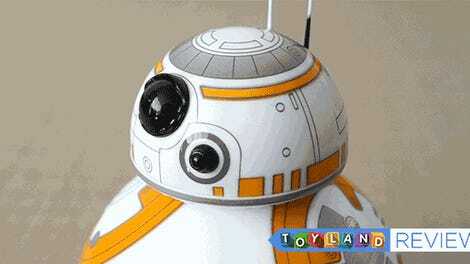 So like a young Anakin, you might just want to build your own droid and save a few bucks.